Cloud hosting is a concept that is rapidly evolving and is being adopted by businesses of all shapes and sizes. This trend is expected to continue because of the numerous benefits which cloud computing has to offer. These pros make cloud hosting a great choice for medium size and bigger enterprises. However, when you factor in the cons, you may realize that cloud hosting is not that appropriate for small businesses. We will look at all of this in detail, but only after we have defined the technology and discussed its main features. Cloud hosting is a service that is operated on virtual servers. Basically, the term refers to the manner in which different computer resources are used. These resources can be either hardware or software, based on a remote machine. The end user receives these services over a network but they do not have any sort of control or influence over them. The user has to place trust in the cloud provider and transfers all of their data onto the server. Probably, the best example of the cloud is the internet itself. 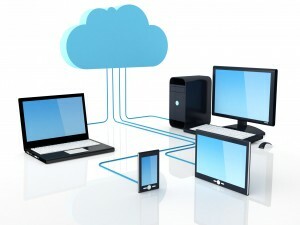 When a user signs up for a cloud hosting service, they transfer some of the processes on their PC to the server, which belongs to the provider. The servers are backed by a huge set of resources such as storage, power and memory, which can be scaled on demand and can be accessed online. Thus, all programs run on the hardware of the cloud provider and the individual can access it through the internet on their own desktop PCs, which can be regarded as a remote terminal. There are many features of cloud hosting, but only the most important ones are mentioned herewith. Users can access the cloud hosting system through a web browser that is installed on their PC or mobile device. All storage devices and services are shared through virtualization technology. This increases utilization and allows easy migration of application from one server to another. Resources are shared among the users which centralizes the infrastructure, thereby reducing costs. Cloud hosting is affordable, allowing you to save a significant amount of money. Moreover, there are many payment options available, which makes it easier for you to budget for the service. Data can easily be backed up and stored as multiple copies by simple techniques. As long as you are connected to the internet, you can access information from simply anywhere. This makes cloud hosting a very convenient option. Technical issues are fairly common with the cloud. At times, it is a power outrage and at others, it is a connectivity problem. Whatever the issue is, you will have to deal with it. Security is a primary concern of the cloud. If you do not choose a provider carefully, you will be exposing all of your data to risk. Cloud technology does not always prevent an attack if necessary measures are not taken. As such, your business may become vulnerable to hackers and there is a possibility of data theft. The following are the most popular cloud hosting providers. « What is VPN Hosting?